That sounds like a dance on a volcano, although Mount Everest isn’t one. According to his team Nobukazu Kuriki has started climbing the snowy Everest North Face. The 34-year-old Japanese wants to climb via the Hornbein Couloir to the 8850-meter-high summit, it said. Probably the “Supercouloir” route is meant, which combines the Japanese Couloir in the lower part with the Hornbein Couloir in the upper part of the wall. The route was opened by the Japanese climbers Tsuneo Shigehiro and Takashi Ozaki in spring 1980. “I am fully focused and start now”, Kuriki said by radio. 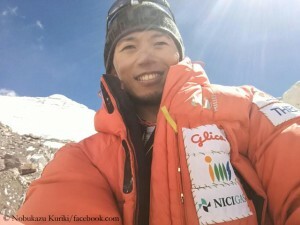 In recent weeks Nobukazu had repeatedly explored possible ascent routes from the bottom of the wall and referred to high avalanche danger. 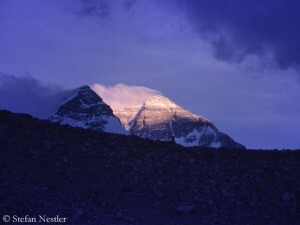 For this reason, Kilian Jornet – as reported – had abandoned his Everest expedition. The Spaniard, known for his high-speed climbs, to his own words had climbed on the Tibetan normal route up to an altitude of 7,950 meters. Shishapangma K 2 Thulosirubari Expeditions Luis Stitzinger Mingma Gyalje Sherpa Cho Oyu Ueli Steck Lhotse Elisabeth Revol Nepalhilfe Beilngries Nanga Parbat Kangchenjunga Karakoram Nepal Manaslu Amical Alpin Alex Txikon Avalanche Tamara Lunger first ascent Dhaulagiri Tomek Mackiewicz Simone Moro Annapurna Mount Everest Pakistan Expedition K2 Ralf Dujmovits Earthquake Billi Bierling winter ascent Makalu Thomas Huber Daniele Nardi winter expedition Broad Peak Tibet Aid project: School up!